Trade Descriptions - there should be some guidance on this concerning word use for bands. 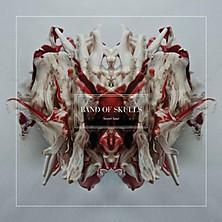 The name Band of Skulls conjours an image of grungy, growly rockers, chomping at the over-driven, reverb-filled bit. Not here, though - seems it's all haircuts and TV ads. But it's always a tricky one, balancing style and substance. Substance over style is solvable, but the reverse would involve ridding an element of swagger and bravado and embraking on a massive learning curve. Not that Band of Skulls are personally full of swagger and bravado, but speaking purely about their music their third release (or fourth if you count their live album, 2010's Live on KCRW's Morning Becomes Electric), Sweet Sour, is decidedly substance-less in comparison to their debut. Everyone has to grow up, but dropping their gnarlyness has left them not whistful but bland. The first and title track is an easy-going yet promising start for their blues-driven rock. It uses White Stripes-esque sounds for a gentle introduction to (what could be) a great album. 'Bruises' is just a standard and rather drab second song, however, and, as with 'Wanderluster', the writing ability is mediochre, suggesting that the technical ability is probably the same. You generally find interesting riffs and fills in the most simple of songs. Three tracks in and it's all panning out to be 'driving music', great intros but repetitive, unexciting and lacking in any substantial melodies or guitar parts thereon in. Nevermind frequent comparisons to The Black Keys, this isn't even as hooky as what we were left with when Kings of Leon cut their hair and went 'all commercial'. Having taken on some of BRMC's drive and grind, 'The Devil Takes Care of His Own' has a nice dirty blues feel, as does 'You're Not Pretty But You Got It Goin' On'. There are some good drum beats and vocal sounds. If the latter had been track one or two on the album, the whole would have been more engaging instead of sending you to sleep through leaning on the boy-girl-sweetheart harmonies all the time. Unfortunately, the oompf just doesn't appear - constant build ups drift off into yet more disappointingly standard and unadventurous chords, and there's a lack of crescendo in nearly every track. You'd expect more from a band with eight years of playing, recording and touring experience under their belts. Guitar solos which could be played by a beginner litter this 10-track release. They're not really pushing the boat out with the playing - it's competent, standard rock, with too feeble a vocal for a rock band. All of which are quite patronising things to say, but these Southampton-based guys seem like they have got the rock 'n' roll image all sewn up yet haven't got the nerve (or ability) to play it properly and let rip.